Under Asian Skies is also available on Kindle. The Under Asian Skies Audiobook is now available as a CD direct from this site. It is also available to download from Audible, i-Tunes and many other outlets. In 2016 we were able to release the New Edition of Under Asian Skies. A new vibrant cover, more text, double the number of colour photo pages, and new pages of black and white photos! I hope you enjoy the journey across this amazing part of the world. 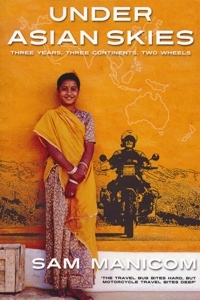 Three years, three continents, two wheels. I just wanted to say what an excellent book this was. Enhanced by the fact that I was lucky enough to be reading it whilst in Thailand I think. Unfortunately I won’t be in Africa to read the other book I’ve just ordered from you. Anyway, thank you, its opened my eyes and given me the push I needed, as I’m hopefully heading off back to Asia in months time and then with any luck Australia and NZ.